The Nitro X has every reason possible to make TenPoint proud since it delivers excellent performance and incredible speed while keeping a low profile. For all your hunting needs, this lightweight and powerful model should be on top of the list. Benefiting from unique technologies and features, it will surprise you with the results you will get when using it for hunting any game. However, you must be aware of the simple fact that the Nitro X comes at a pretty hefty price. While it is true that you will get a lot of goodies with your purchase, the fact that it is so expensive might not be easy to overcome unless you’re a seasoned hunter with some money to spare. Any buyer would be interested in what the crossbow has to offer regarding construction or durability. The Gordon composite used for making the limbs of this model is of high quality, and it is renowned for its sturdiness and reliability. However, the way the crossbow is constructed, and not only the materials used, puts this crossbow in a league of its own. The RX7 cams work with a spiral cable groove that leaves room for the unique Max Rotation feature in place. What happens when you draw your bow is that the string begins to contact some rollers mounted on the rail, in such a manner that the limbs and the cams are forced to move inward. At the same time, the string comes off the respective rollers, creating the reverse draw system such crossbows are known for. These construction aspects are important because they make possible some of the great features this model comes equipped with. You would not get such amazing results regarding speed and accuracy with this bow if not for its particular construction. One single look at this crossbow and you’ll be sold. When cocked, from axle to axle, the crossbow measures only seven inches, so you will find it ideal to use it anywhere, on the ground, when in a tree stand, or when you’re waiting in a blind. 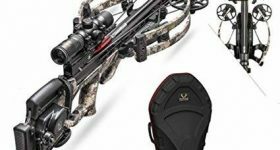 Due to its sleek profile, the model is also portable, not to mention that it weighs just 7.8 lbs which is less than the many other crossbows out there that weigh over 8 or even 9 pounds. Another design element that will surely make you think that you should put this model on your wishlist is the balanced design that makes it feel lighter than it is. The reverse draw technology used makes it so maneuverable that you might even be able to use it with just one hand. Delivering incredible speeds of up to 440 fps, this model is a good option for hunting any prey. The beautiful camo pattern also makes it a hit with hunters everywhere. There are so many amazing things about this crossbow that it is hard to sum them up. The Sling Shot technology used by the manufacturer ensures that the bolts will be released from your bow at incredible speeds. At the same time, the crossbow develops an energy of 166 ft-lbs, which is why you can expect it to behave admirably in the field, no matter the size of the game you are after. You will be extremely pleased with how accurate this crossbow is, and it all happens due to the Vector Quad technology used for the cables. 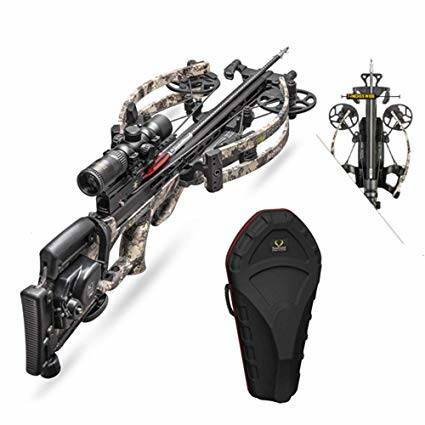 Another thing that makes this model such a coveted crossbow for most hunters is the AcuDraw cocking device it comes along with. Draw weight is always a sore point for hunters, and it is nice to have such a great ally by your side, as this mechanism will cut what draw weight you feel in half. The same technology makes cocking your bow a breeze, and you will love how easy and smooth it operates. Let’s not forget that this model comes with a RangeMaster Pro scope mounted directly from the factory. That means that you will be able to use it straight out of the box. Seeing that the manufacturer also includes six EVO-X arrows with your purchase, you won’t wish for anything else. Another nice extra provided is the TenPoint Stag case that will let you move your crossbow around without fear that you might end up damaging it in some way. Don’t let your prey sense you approaching, and use this crossbow. It is dead silent, too, due to the string stop system in place that is practically integrated with the crossbow. Since the release of arrows at such incredible speeds as this model delivers can cause a lot of vibration and sound, it is a great thing that the manufacturer thought about installing it directly into the construction of the crossbow. You can’t not love the TenPoint Nitro X. It has the making of a great crossbow, and it is balanced, fast, and accurate. It feels lighter than it is, even with all the accessories mounted on it. You will get a complete kit with a scope and arrows to shoot, so you will not be left wanting for anything else. Even a carrying case is provided. However, be aware of the high pricing. Not everyone can easily afford this model.